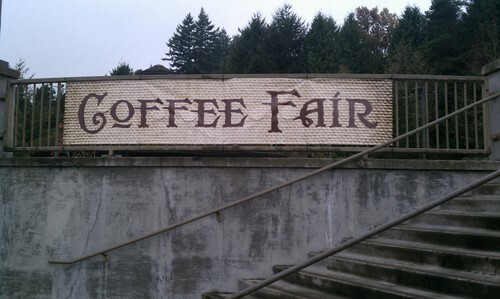 I took a quick trip up to Coffee Fair this morning at the World Forestry Center. For $8 you could try coffees from ten or twelve different roasters. It was a pretty quiet event compared to last week's Coffee Fest. Many of the roasters were from Portland, but some had come from as far away as Sisters, Oregon and Olympia, Washington. 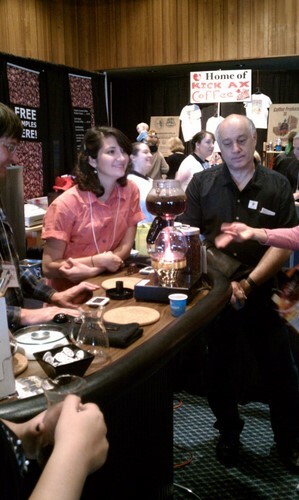 My favorite coffee from the morning was Nossa Familia's Italian roast, brewed in a French press. It was a sweet and toasty dark roast. For those interested in roasting their own coffee, Mr. Green Beans (Trevin Miller) was there to help you decide which coffee to roast and how to do it. I didn't stick around for too long, and only managed to get a couple pictures worth sharing. An interesting contraption for cold-brewing coffeeTwo booths were giving out free samples of vacuum pot coffee. If I had only known. . .